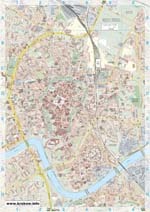 There won’t be any difficulty in planning a romantic vacation in Krakow. Travelers have a long list of quality hotels to choose from, and Komorowski Luxury Guest Rooms is one of them. Its rooms are made in black-and-white and come with stylish red colored accessories. 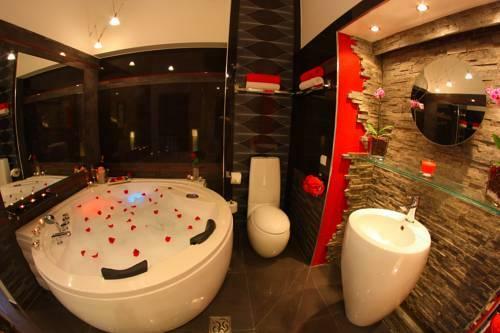 The black-and-white Jacuzzi in bathrooms look absolutely striking when decorated with red rose petals. Some guestrooms have an artificial waterfall, while in other rooms travelers will find an ultra-modern tropical shower. The original stone walls with small niches, which feature tiny vases with flowers and aroma candles, add special charm to the guestrooms. The beautiful Hotel Amadeus , which is located not far from the central market, is also distinguished by a romantic setting. The hotel is open in a fully restored building that dates back to the 16th century, and all of its guestrooms are distinguished by a large size and inimitable décor in mostly cream shades. Posh handmade furniture in Baroque style makes up a harmonious combination with original beams. Stylish table lamps and modern textiles only help to create a modern and elegant look. There is a fitness center in the hotel, which comes with a romantic relaxation area and hydro-massage baths. It’s hard to find a better place for a romantic break away together than Boutique Aparthotel . All guestrooms of this hotel seem to have been created particularly for a romantic and serene vacation. Giant beds with crisp white bed clothing and skillful embroidery, semi-sheer curtains on windows and a pleasant lighting system – these simple elements were enough to create a truly unique atmosphere in the hotel. Boutique Aparthotel is surrounded by a charming garden, where the hotel’s staff installs beautiful terraces in summer. The famous Hotel Dwór Kościuszko is open within the territory of picturesque Kościuszko Park. Romantic visitors will be pleased with charming and cozy guestrooms that feature antique furniture and are made in white and red. Besides relaxation in beautiful rooms, travelers are invited to participate in various interesting and romantic entertainments. They can make a walk in the garden, explore the surroundings from one of the terraces, try elite wine and popular national delicacies in the hotel’s restaurant. The atmosphere of calmness and seclusion, which reins in the hotel, helps to enjoy a comfortable holiday. Hotel Kontrast may be the best option for travelers who seek a romantic holiday away from the city noise. The hotel is located in the middle of a miraculously beautiful landscape garden, so many regular guests of the hotel prefer to book rooms for the summer season. Silent rooms with much of natural light are made in minimalist style, so nothing will prevent you from enjoying the splendor of nature. The charming restaurant, the hall of which has elegant wooden furniture and antique decorations, serves the most popular dishes of Polish cuisine that are cooked in accordance with classic recipes. Angel House Bed & Breakfast Budget travelers should also not deprive themselves of the pleasure of staying in a romantic setting. Instead, book a room at Angel House Bed & Breakfast that looks like a stylish boutique hotel. Guestrooms are mostly made in white and feature posh chandeliers in medieval style. There are flowers and plants in all rooms. Large mirrors in massive wooden frames and luxurious curtains of deep emerald color create a truly posh feel. All five guestrooms of Angel House Bed & Breakfast are made in individual style and will please even most discerning romantics. 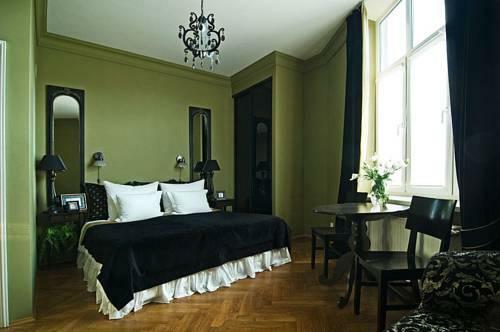 This guide to romantic hotels in Krakow is protected by the copyright law. You can re-publish this content with mandatory attribution: direct and active hyperlink to www.orangesmile.com.